Taking a look at the deception of play known simply as “Fight Song”, and how Big 12 offenses are tweaking it. The tackle eligible play has been a deception staple in college football, and Big 12 offenses have recently been adding their own twist to the concept. Tackle eligible is where the offense manipulates their alignment on the line of scrimmage to leave an offensive tackle (or someone in the tackle’s place) eligible for a pass. In today’s Film Room, we will look at three Big 12 schools have recently used a variation of the tackle eligible play. The Baylor Bears are the most famous team to use such a concept, lining up 410 pound LaQuan McGowan as a tight end. Here, the Bears placed McGowan at left tackle and had a tight end on the right side, but the receiver on the tight end’s side is covering him up as shown in the diagram above. This leaves McGowan eligible since he is the only player on the line of scrimmage at this point. As quarterback Bryce Petty explained to former NFL head coach Mike Gruden, Petty had the option to either throw to McGowan or carry out the speed option to the right side. The linebacker crashed on the option action, leaving McGowan wide open in the middle of the field. The Cyclones used this concept against the Kansas Jayhawks in October. Unlike Baylor, they spread out the receivers five wide to open up the middle of the field. Wide receiver D’Vario Montgomery lined up as the left tackle while the actual left tackle, Jake Campos, lined out wide as a wide receiver. Campos was used as a decoy on the perimeter, but because he is covered up by the receiver outside of him on the line of scrimmage, he was ineligible. Montgomery slipped through the middle of the field uncovered for an easy 25 yard gain. This variation of the tackle eligible was made famous by current Auburn head coach Gus Malzahn. Malzahn calls it “Fight Song”, because the offense ends up scoring, and then the band plays the team’s fight song. 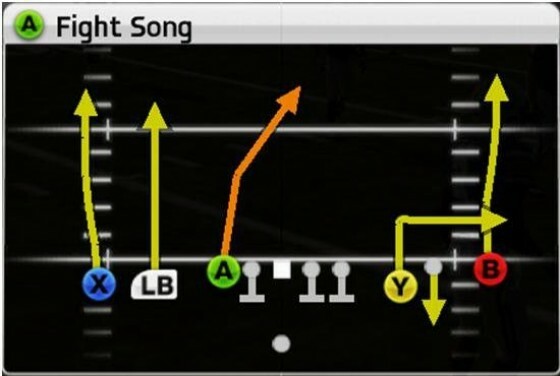 “Fight Song” has become so famous in the college football world, it was actually installed in the NCAA Football video game series a couple of years ago. Oklahoma State used the “Fight Song” concept most recently in their win over the TCU Horned Frogs. The Cowboys placed tight end Zach Veatch at right tackle, and instead of having an actual right tackle out there, they only had four lineman on the field. Both receivers on the left side are on the line of scrimmage, leaving the inside receiver ineligible. This receiver is now technically a lineman because he cannot go down field for a pass. The Cowboys added their own flare to the play by faking a power with backup quarterback J.W. Walsh. The back-side guard pulled, and Walsh faked a power; this pulled in the linebackers and gave Veatch a chance to go down field for an easy reception. The tackle eligible play is one of the most deceptive and interesting trick plays out there. Such a play fits perfectly with the Big 12, a conference full of distinction and offensive innovation. The Cyclones, Bears and Cowboys are not the only ones who have used it before. Keep your eye out for “Fight Song”, and when you see a tackle going out for a pass, you’ll know what’s going on.